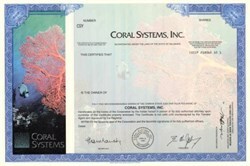 Beautifully engraved specimen certificate from the Coral Systems, Inc.. This historic document was printed by Security-Columbian Banknote Company and has an ornate border around it with a vignette of a tropical fish swimming in coral. This item has printed signatures by the Company's President and Secretary. This is the first time we have had this certificate for sale. Founded in 1991, Coral Systems, Longmont, Colo., was a leading provider of innovative products for the wireless industry. Coral Systems products included several software offerings, such as: Fraud Buster, fraud detection system; ChurnAlert, customer retention system; veRiFier, an RF signature product; and Home Location Register (HLR), which brings pre-call, industry compliant capabilities to cellular, enhanced specialized mobile radio (ESMR) and emerging personal communications services (PCS). These products assisted wireless carriers in all phases of their development and day-to-day interactions with their customers. Coral Systems' proven expertise has led to the signing of agreements with top domestic and international wireless carriers. Coral marketed its products worldwide through a national accounts program and strategic partnerships with Cincinnati Bell Information Systems (CBIS), Ericsson Radio Systems, Motorola, Northern Telecom, and Sun Microsystems. In 1997, Lightbridge Inc., agreed to acquire Coral Systems Inc.